The Manchester based locomotive builder Beyer - Peacock had been successfully building Garratts for many companies all over the world since 1909. Despite BP's eagerness to have a decent showcase in their own backyard orders in the UK failed to materialize. In the early twenties the LMS showed interest in the Garratt design to eliminate double heading on various routes. There seems to have been a great deal of discussion about the design. LMS insisted on their standards being applied to Beyer Peacocks proposals, like the typical uneven spacing of the driving axles and standard LMS axle boxes. Beyer Peacock proposed a 2-6-2+2-6-2 design but Fowler's design bureau insisted on leaving out the centre carrying axles despite BP's concerns about axle loadings. Consequently axle box heating was a problem to plague this class during its entire life span and it is a pity that BP gave in to the LMS design bureaus demands. The first three were delivered in 1927, numbered 4997-4999. After an ample period of testing and tuning 30 more were ordered which where put into service in 1930, curiously with lower service numbers, 4967 to 4996. Getting the coal from the bunker forward proved to be "a challenge". Two experiments were done to improve the forwarding of coal. One locomotive of the main batch, no 4986, received a rotary bunker from the start. Steam operated coal pushers were installed on no 4996. As the latter did not prove adequate, rotary coal bunkers were fitted to all but two members of the class from 1931 onwards. Only 4998 and 4999 retained their standard bunker all their working lives. LMS Garratt No. 47999 on a down goods approaching Loughborough 6 October 1950. View SE, towards Leicester on the Midland Main Line. No. 47999 was built as 4999 in 4/27 and withdrawn in 1/56. Nos. 47998 and 47999 were the only two of the 33 which were never fitted with rotary coal-bunkers. 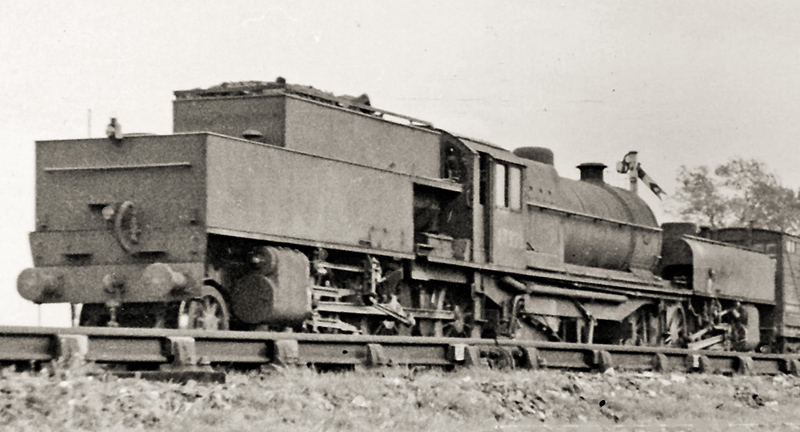 A cut out of a photo showing the rotary bunker later fitted to all but two members of the class. Actually they are not rotating but rocking from left to right. © Bundeena2230 Released under the GNU Free Documentation License. An OO (1:76) scale model of the class was announced by Hattons Model Railways in cooperation with Heljan (Denmark) in the late summer of 2011. I read that announcement in a UK magazine I had bought during my holiday in Wales. Oh boy, I couldn't wait to get home and place the order ;-) The model was due for Christmas 2012. That seemed a long way then. My patience was going to be tested. It wasn't until February 2014 that the Hattons parcel finally arrived. But it was well worth the wait, and honesty demands that Hattons kept me well informed on the progress. To the best of my knowledge this is only the second ready to run Garratt model, after Eureka's AD60, to be available for the mass market so Hattons must be complimented on this undertaking. Very commendable. The model is very affordable. The price tag of £199 may be a tad high for UK standards but by European standards quite normal. Märklin and the likes do no even so much as blink their eyes at prices well over €400. Considering this is a Garratt model its price can even be called remarkably low. There is hardly any Garratt kit available for this price, so again Hattons have to be commended for this. Anyway when I saw it announced and available for pre-order it was a no-brainer. The loco arrived in a sturdy box, well wrapped in bubble plastic and unable to move in the outer box. The box itself is more or less normal by today's standards: well packed, shockproof. Much less the display boxes from the early seventies, but then shipping models by the mail was unheard of. In its opened protective casing. I chose the version with the standard bunker because I have a kit with a rotary bunker on the shelf, so one day I'll build the version with the rotary bunker myself. This particular engine is from the second batch delivered in 1930. If want you to run it truly time correct on your layout, you'll have a hard time as it was soon fitted with a rotary bunker. It entered service on Oct 4, 1930 and appeared with a rotary bunker on Jan 13th, 1932. The good news though is that Hattons's website presents all versions, so if you have a particular timeframe in mind, you may be well able to choose the suitable version. The coal bunker is covered with a canvas screen that rolls up like window blinds into the box at the rear of the bunker top. 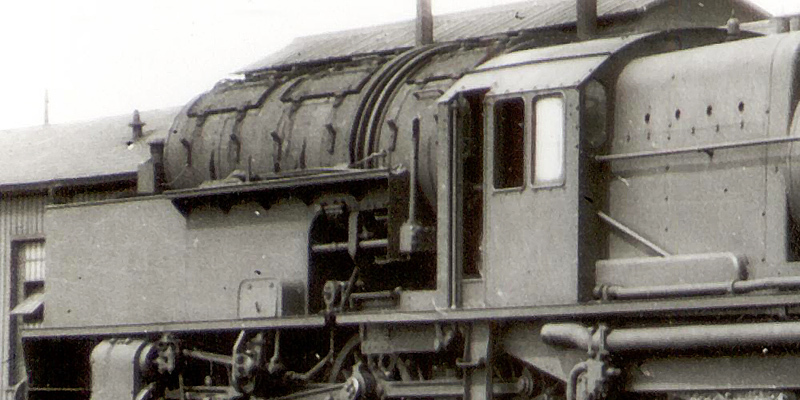 The locomotives were supplied with this feature to combat the coal dust but the covers were hardly up to the harsh life on the footplate and were soon "torn to shreds". I saw no easy way to remove this cover. There may be nothing under it except the locomotive's internals. I read somewhere it is removable. The good thing is that it shows an unusual feature and that gives you always something to talk about when you show the model. Everybody has coal in the bunkers, and you have a canvas cover!! Close-up photos are always hard critics and this one is no exception. The general impression of the model is very good. It a sturdy and faith depiction of the prototype with a splendid finish. There a lot of good in the details. Note how thin the steps are. Riveting is good as well as most other details. Well done indeed. It must be honestly said that there is some disappointment in the details. Some small details could have been better: steps are not really straight, the left buffer (right on the photo) is tilted down, the small left handgrip could have been placed better, there is an uneven gap between water tank and buffer beam etc. etc. Distracting is the odd stain / scratch on the left (right on the photo) of the water tank front. Is it nitpicking on a generally good model? "Dunno", after all we are modellers bent for detail. Looking at the bright side: you will find enough small things that can be improved. The model I ordered is described as "lightly weathered". This effectively means that everything below the footplate is sprayed with a dark grey dull coat. It is very lightly weathered indeed, I had to look hard. This is what a locomotive would look like after its first revenue earning service run. My fears that the weathering would be overdone proved wrong. Note how thin the buffer pads are, again very well indeed! Some critisism goes to the valve gear. It is chemically blackened I think, and this is not done very properly leaving many places blank or stained. But again, just look how well the valve gear is modelled. Absolutely brilliant. One small remark is that the radius link (1), the half moon sized rocking rod, leads nowhere. It should have been attached to the radius rod (2) to control the locomotive's power and direction. The builder's plate is almost but not completely readable. It is not etched but printed, a reasonable compromise as etched builder's plates tend to be unreadable and too thick. Rivet counters do your job, a quick comparison with photos showed me no major differences. The LMS lettering is simple. The yellow is bit vague and the letters are not entirely crisp, but good enough. To the best of my knowledge they are correctly depicted without the elaborate fancy frills that often show up on more prestigious UK locomotives. The suspension of the combination lever is a bit tilted, but this was only the case for this particular one, the other three were in order. The rear of the loco. The trough on the side of the bunker is typical for the 29 locomotives of the main batch with standard bunkers. It is used to store the firing equipment. This trough is a bit warped but this is only visible if you look along the model from the back. The ventilator of the rear tank. Neither one sits entirely straight. The water hatch on the rear unit. Note the well detailed lifting eyes. Four safety valves, two pairs. They were in pairs because the sheer volume of the boiler required sufficient outlet diameter to control the pressure. Each pair was adjusted for different boiler pressures. The pair for the lowest pressure would start blowing off. If that would not suffice and the boiler pressure continued to rise the second pair would cut in. The open roof hatches allow a view on the boiler backhead. The shed code correctly reads 18A, which is Toton. On the right side the footplate's edge is roughly finished and shows odd stains. The left side is better. The lifting eyes on the front unit are placed too flat and there seem to be scratch marks. When handling the hefty locomotive you will soon find that the front unit separates easily from the boiler unit. Putting it back gives a nice surprise: it snaps into place! There is a magnet below the boiler and a corresponding metal plate on the power unit. A simple and ingenious solution that holds the locomotive together very well and yet makes it easy to take the locomotive apart. Good idea for my AD60! I guess the metal plate is the magnet. The full length of the loco's underside. It doesn't even fit in my foam cradle. A look at the brake rigging. Note the very well coloured wheels. Not black, nor shiny silvery, but a nice dull steel sheen. Very good!. Power is taken from four wheels on each unit. They are interconnected, so if only one unit gets the power then it feeds the other. This ensures a reliable electric contact. The undercarriage of each unit holds two technical surprises. The second and third axle are grouped in a sub-chassis. The first axle is the datum (fixed). The whole subframe can tip over a point halfway between the second and third axle. The second axle can move up and down in the subframe. The third axle can move oppositely down and up but it can also tilt within the subframe. Ergo Heljan have provided full compensation! For me that is a first ever in a mass production model. The driving rod is consequently cut in two separatedly moving rods so as to allow free vertical movement of the wheel. This is the effect: even if one wheel lifts off the track by more than its flanges, as demonstrated here and believe me it better not, even then the other five wheels of the unit stay firmly on the track. This greatly improves the reliability of the model in terms of tractive effort and electrical pickup. The other secret is in the leading bogie. It holds the coupling and I was worried that it would lift off the track with a heavy train on the hook. When the model is firmly on the rails the bogie can not move upwards and the full weight of the locomotive holds it firmly on the rails. Simple but clever. It is an impressive model. The general impression is very good and I would not hesitate to put it work on a high quality layout. As the locomotive is hefty, has two motors, runs smoothly and has twelve driven wheels it will make a good puller. For the display cabinet there are some issues. It lacks workmanship in the detail. The model shows all signs of hard work and fast assembly in the factory. But nothing serious really, most things can be corrected, all details are there and of potentially good quality. My fingers are itching to take the locomotive apart and reassemble it correctly. Personally I'd prefer a little higher price and a neat assembly. But do not forget this is a mass produced model for a relatively low price. Do not compare it with high grade super detailed hand built models of Micro Metakit and the likes, in which case this model might have been in the area of £2,000. I did a test ride and it runs smoothly. The locomotive does not appear to be a good crawler, but this could be the lack of some good running in. Fitting a decoder will undoubtedly improve that. Together with full compensation and good electrical pickup this locomotive will be a good performer. Verdict? I dont't want to be overly critical about the detailing issue, I will come to the defence of the good initiative of Hattons. Generally it is a very good model, for a price you can hardly get a kit for. For just £200? Go get it!